The Make Your Own Snow Globe Kit allows children tremendous creative freedom in designing their very own snow globe. As opposed to more traditional art kits in which kids merely piece together components into a predetermined result, the Make Your Own Snow Globe Kit pushes a different philosophy: encourage each child's innate creativity! Each kit includes a random color selection of make-and-bake modeling clay, glitter, a cardboard stand (ripe for decoration! ), a plastic globe, and a sheet of EVA foam. 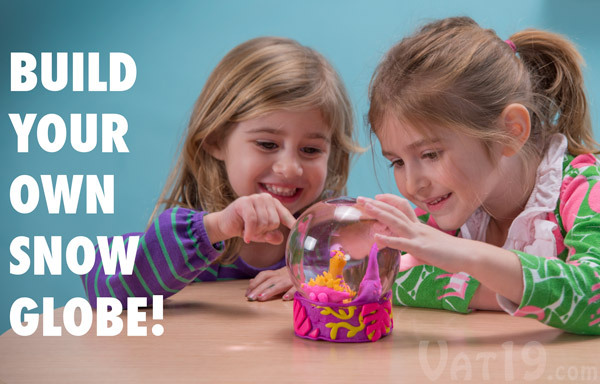 Kids will love making their very own snow globe! With the Make Your Own Snow Globe Kit, your kids will have everything they need to create their very own snow globe. With the included make-and-bake modeling clay, they can turn the inside of the plastic globe (no breakages!) into a glittery world of their own design. Children are certain to love the Make Your Own Snow Globe Kit. Most art kits discourage creativity and individuality because they're the artistic equivalent of "some assembly required" furniture. Those kits ensure that everyone's project looks the same. And that's boring and generally horrible. Happily, that is not the philosophy behind the Make Your Own Snow Globe Kit. 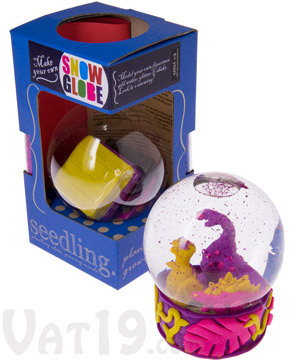 The Make Your Own Snow Globe Kit contains the necessary materials, but leaves the design completely open-ended. Your kids can sculpt any world of their choosing inside the globe and they can decorate its base with crayons, markers, stickers, foamies, modeling clay, magazine cut-outs, or any other material they desire. The simple (aka smart) decision by the creators to include random colors of modeling clay within the kit ensures that every child's work is different. Remember, there's no right or wrong when it comes to art. Enjoying the process of creation is the goal. is the goal of the Make Your Own Snow Globe Kit. The Make Your Own Snow Globe Kit contains everything your kids will need! 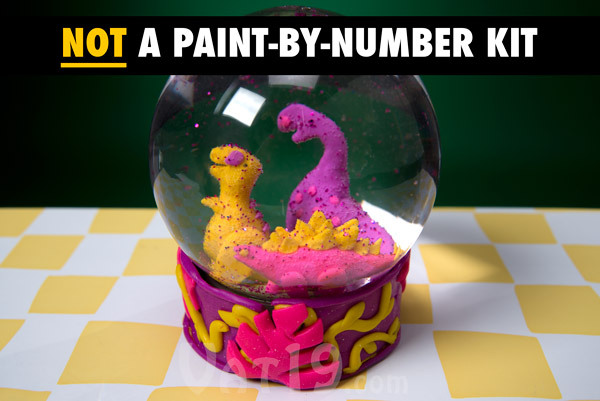 It includes two vials of glitter, a small foam sheet (for cutting out a water-tight seal), a cardboard base (which your child can decorate), a plastic globe, four squares of make-and-bake modeling clay, and an instruction sheet. All you'll need to add is water and a trip to the oven in order to "fire" the clay. 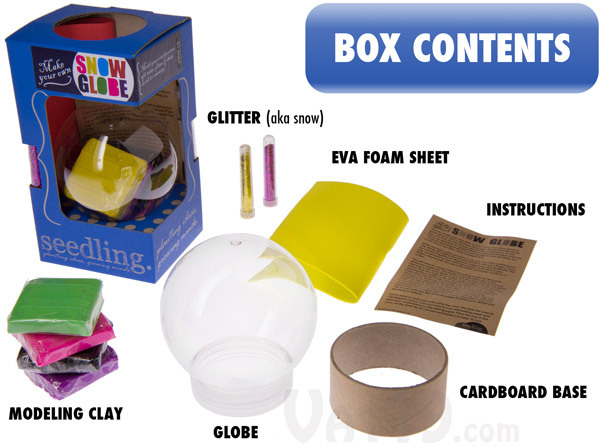 The Make Your Own Snow Globe Kit includes everything required to design your own snow globe. Question: How long does it take to make? Answer: That all depends on how intricate the child's design becomes. However, after they are satisfied with their sculpture, an adult will need to put it in the oven for approximately 30 minutes. After the clay has baked, it is best to allow it to harden and dry for 12-24 hours before completing the assembly process. Question: What is the EVA foam sheet for? Answer: You will cut out a round piece of this foam to use as the water-tight seal for your globe. Question: Can I request specific colors of clay? Answer: No. Each kit contains four random colors. Question: Wouldn't it be faster to just buy my kid a snow globe? Answer: Sure, but what fun is that for your child? Kids love to create things! And what is more magical than their very own snow globe? Nothing. Building their own ukulele, however, is probably on equal footing. So, buy both and you'll have double the magical-ness!